The knight’s sword was not just a cutting weapon. A well-aimed thrust delivered with the impulsion of a moving horse was a deadly combat technique. It was also an effective attack from the ground. The player on the left is using an imbrocatta. Note the crossed hands. 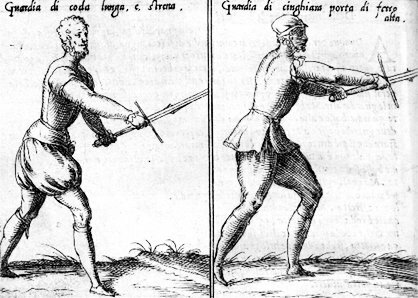 There are four basic types of thrust, defined by the orientation of the sword hand. 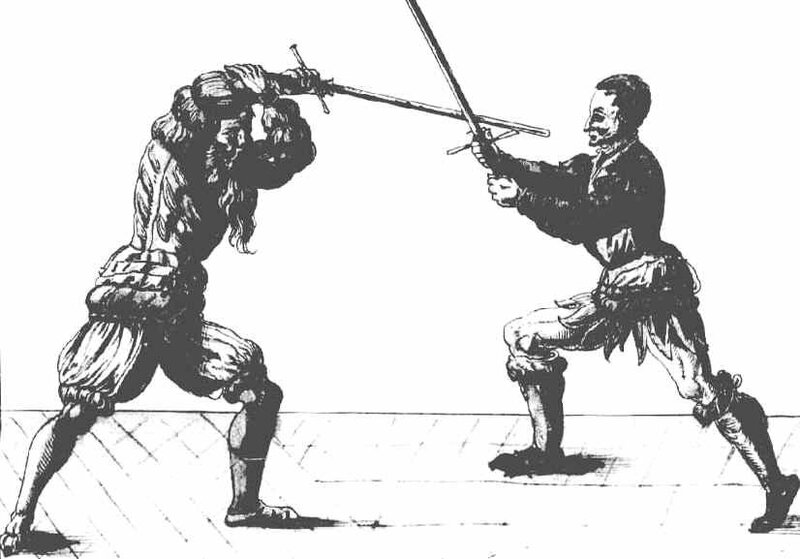 Those of you who practise rapier fencing will be familiar with these positions as prima, seconda, terza and quarta. 1. Imbrocatta: delivered with the true edge of the sword (knuckle side) upwards, and the palm facing outward (prima). This is a descending thrust, with the hand high and the sword point lower. When using the sword in two hands, the wrists will cross. If the imbrocatta is difficult to acheive without contorting your body you can adjust your hand on the sword slightly so your thumb comes underneath. 2. 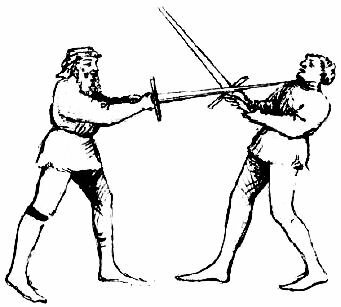 Dritta: delivered at shoulder height with the palm down (seconda), this thrust comes from the right side of the body if you are holding the sword right-handed, hence the name, which means ‘right’. With two hands on the sword the pommel hand will be underneath the forearm of the sword hand. 3. Stocatta: an ascending thrust, delivered with the true-edge of the sword down (terza). The hand is low and the sword tip higher. This thrust can also be delivered slightly to either side (terza-seconda or terza-quarta). 4. Roversa: coming from the opposite (‘reverse’) side of the body, this thrust is delivered palm up (quarta). Like the dritta, this thrust is at shoulder height with the sword parallel to the ground. Your thrust should be stable and direct. If the point wavers as it travels it will decrease the speed and power of the thrust, so practise making your sword travel on as straight a line as possible. Proper timing of hand and foot is important. Extend your arms fully into position before stepping into the thrust. Not only does this ensure your safety by first putting your sword between you and your opponent, it creates the maximum power for your strike. Practise slowly at first, ensuring that your order of movement is smooth and natural and you can easily adjust your hands as you move through various thrusts. Only speed up once you can put it all together well, and slow down again if you find your form starts to fall apart. This entry was posted in Cavaliere Archives and tagged swordplay. Bookmark the permalink.